I’m delighted that Hocus Pocus Diplodocus has been chosen among five books being converted into an ‘early reader’ format by Maverick Books. ‘Early readers’ are the books used by primary schools to help children who are just starting to read. These are essential books in a child’s transition from a listener to a reader of stories. They have a clear layout, with the text separated from the pictures so it's easier to read. To convert the original picture book text into an early reader, it had to be edited and shortened slightly, cutting out any words that would be too difficult for beginner readers to decode. In the case of Hocus Pocus Diplodocus, that meant stripping out some of the trickier dinosaur names, like “pterodactyl” and “triceratops”! Maverick employed an early years consultant to assess the books and make recommendations for adapting the text, and also to allocate the books to the appropriate ‘book bands’. Children progress through these coloured bands as their reading skills develop, so it was vital that each Maverick book was correctly graded in line with education industry standards. As well as adapting the text, Maverick added some questions about the story at the back of the book. These are an important feature of early readers, designed to test a child’s understanding of what they have just read. The Maverick early readers will be released in August, just in time for the new school year. They will be marketed direct to schools and libraries, but will also be available to buy online from all the usual online booksellers. They will be available to buy individually, and also as a fabulous box set of five books. Here’s hoping this exciting new version of Hocus Pocus Diplodocus helps to inspire a love of reading – as well as dinosaurs – among lots of eager new readers. Apologies to regular readers of this blog for the long interlude between posts. I thought it was about time I shared some exciting developments in the world of Hocus Pocus Diplodocus. 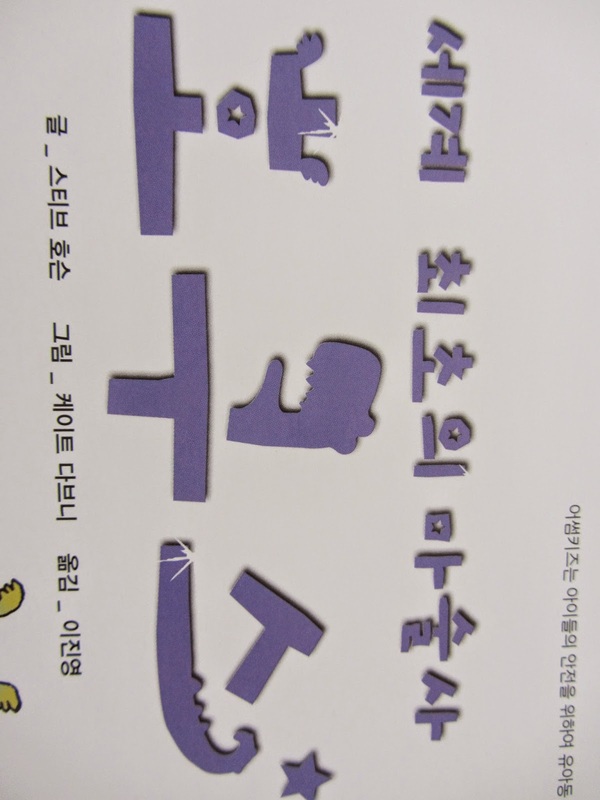 First up is the news that the rights for the book have been sold to Korea. 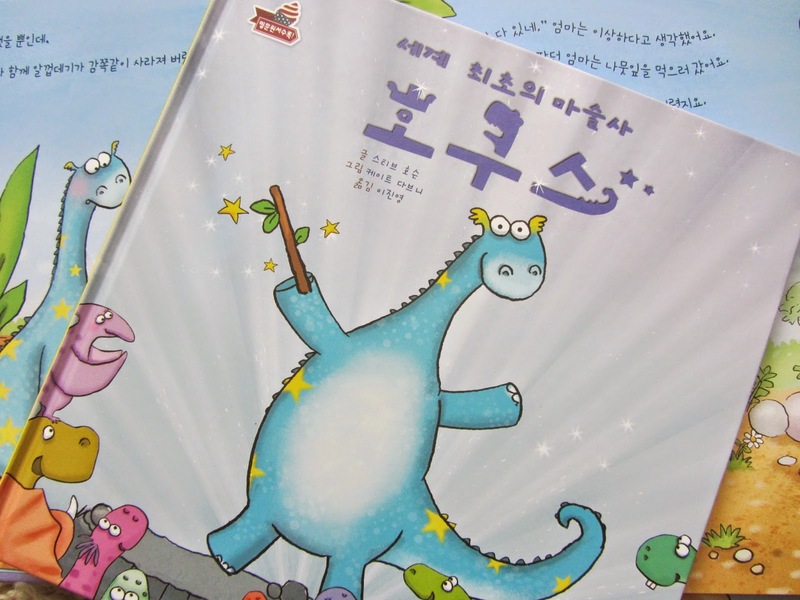 That means there is now a Korean language version of Hocus Pocus Diplodocus available for little dinosaur fans in Korea. I was sent two copies of the Koren edition, which is published by Awesome World. It looks, well... awesome. ... and the second half is the English language translation. I assume this is to help the multilingual children of Korea learn English. It's very exciting to think that children on the other side of the world are enjoying my story. Thanks to fellow Maverick author Alex English for inviting me to take part in this 'Meet My Character' blog tour. Alex's delightful debut children's book, Yuck said the Yak is out in September, and she introduced us to the book's main character last week. This week, it's my turn to tell you a bit about the lead character in my new book, Hocus Pocus Diplodocus. 1. What’s you character’s name? Are they a fictional or historical person? He is called Hocus P. Diplodocus, and he is entirely fictional. He doesn't get his magical middle name until part-way through the book. The story is set 150 million years ago, in the land of the dinsoaurs. Hocus is not like the other little dinosaurs. For a start, his skin is covered in star-shaped blotches, and he soon discovers he can do some pretty unusual and surprising things that the other dinosaurs can not. 4. What is their main conflict? What messes up their life? Most of the time, Hocus is in control of his magical powers. But sometimes, usually when he sneezes, he makes things disappear by accident. This certainly has the potential to 'mess up his life'! 5. What is their personal goal? To entertain and amaze his fellow dinosaurs by performing incredible tricks in his weekly magic shows. 6. What is the book’s working title? Can we read more about it? The book is called 'Hocus Pocus Diplodocus', and the illustrations are by Kate Daubney. The book is out now and available to order from online retailers. It is also (hopefully) making it's way into a bookshop near you! 7. When will it be published? It was published in May 2014. Next week, it's the turn of another Maverick author, Rachel Lyon, to introduce you to the main character in her forthcoming book, called I Wish I'd Been Born a Unicorn - don't miss it! 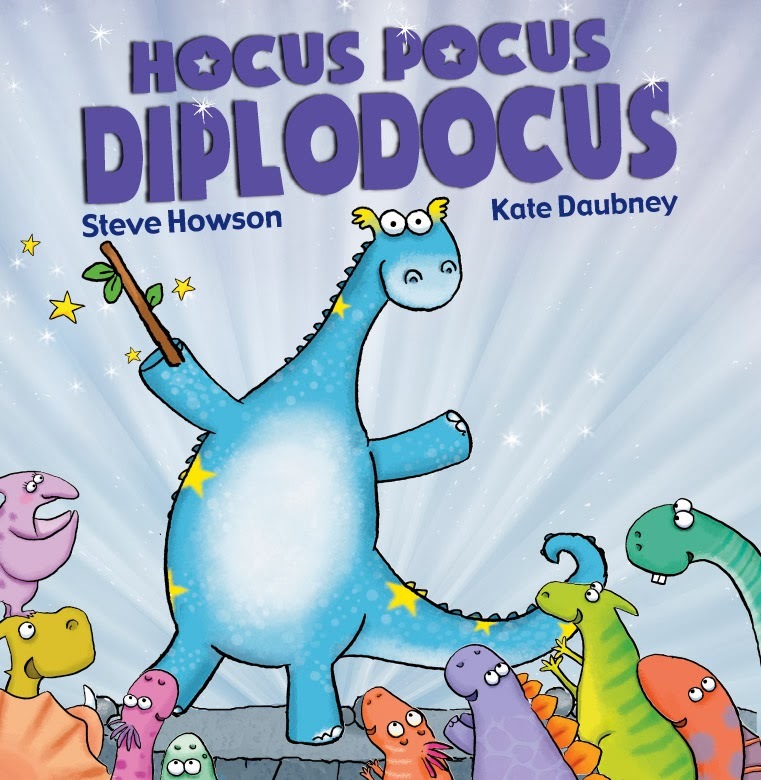 I'm delighted to say that my debut children's picture book, Hocus Pocus Diplodocus is now out there in the world. It was released about a week earlier than expected, in mid-May. Now begins the challenging task of getting it noticed in the crowded world of children's picture books. In the sadly shrinking bookshops of the UK, shelf space is at a premium, which means it's increasingly difficult for a debut author to get their book on display to the public. My publisher, Maverick Books, works hard to sell the book into the major booksellers, while its army of sales agents promote the book to a host of other distributors, independent booskshops and outlets. Away from physical retailers, the book is now widely available to order from online outlets, including Amazon, Waterstone's, The Book Depository and many more. In a bid to get it noticed and talked about, Maverick has also sent the book out to a long list of book reviewers. It's been a joy to read the early reviews which, I'm pleased to say, have been very positive. Here's a sample: Reviews4kids, The Book Bag and Parents in Touch. It's extremely rewarding to read comments from people I've never met who are enjoying my story. It's even better to find out that children are enjoying it! While the publishers do all they can to promote the book, it's also up to me to get out there and bring it to new audiences. This process kicks off in earnest on 21 June, when I'll be doing a 'Meet the author' event at York Waterstones. I'll be there from 1pm-3pm, if you'd care to pop along. Hopefully we'll get plenty of children in to enjoy the book and take part in some ever-popular colouring-in activites. Finally, I should say that whatever happens to the book from now on, nothing can beat the feeling of having a real book published for the first time. I'm so pleased with the way my story has been brought to life by Kate Daubney's bright, funny, lively illustrations. If you ever get your hands on a copy, I'd love to know what you think. As the long-awaited (by me, at least) publication date for Hocus Pocus Diplodocus approaches, the sense of anticipation is building and lots of exciting things have been happening to prepare for the book’s arrival. The rest of the books have now been printed and are due to arrive on these shores any day. They will be despatched to the warehouse ready for distribution and should officially be released by the end of May. Earlier in April Maverick Books and I put together a press release about the book, spoiled slightly by a full colour picture of my grimacing visage, but rescued by some lovely images from the book itself. This has already been sent out to various press, and more will be going out nearer the publication date. The whole book-publishing experience still seems somewhat unreal to me. To reinforce these disconcerting feelings, I arranged my first book-signing event (what?) in the York Waterstones store. It will be on Saturday 21st June, 1pm-3pm – if you’re in the area! Even if you’re not, I’ll still be there. There’ll be colouring-in sheets for kids and, of course, copies of the book to peruse, and even buy! Steve Bicknell, Mr Maverick Books himself, will be there to mark what will be the book’s official ‘launch’. Once the book is in stock, Maverick will send a couple of hundred copies out to reviewers to start getting it talked about. Good reviews, I’m told, are essential for getting the book noticed and ‘in demand’. I can’t wait to start reading people’s reactions to it. While most reviewers like to have a physical book to read, some are happy to review from the pdf files. One of these is ‘Reviews4kids’ which, I’m delighted to say, were the first people to review Hocus Pocus Diplodocus. I’m even more delighted to say that they liked it! 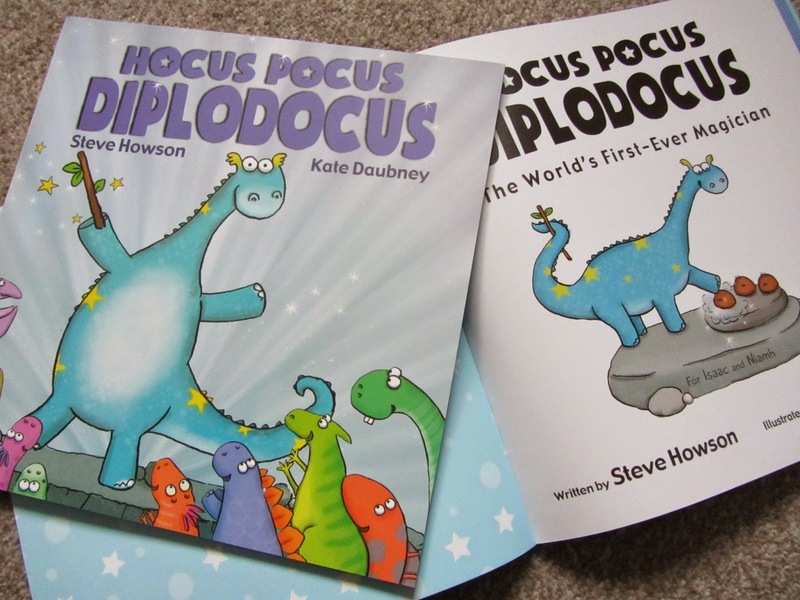 You can read their review here: http://reviews4kids.co.uk/hocus-pocus-diplodocus/. I also did an interview for them, which will be on the site soon. As a life-long bookworm, I was overjoyed to be able to attend the London Book Fair this year – for the first time. It’s the UK’s major trade fair for the book industry. I spent a blissful day wandering around, browsing new releases, goggling at the extravagant stands of the big publishers and attending some useful seminars offering tips to authors. Of course, I also met up with the Maverick team on their glorious stand. It was great to catch up with Kim, Steve and Karen, and meet some of their other authors, as well as some of the sales agents who will be promoting my book. 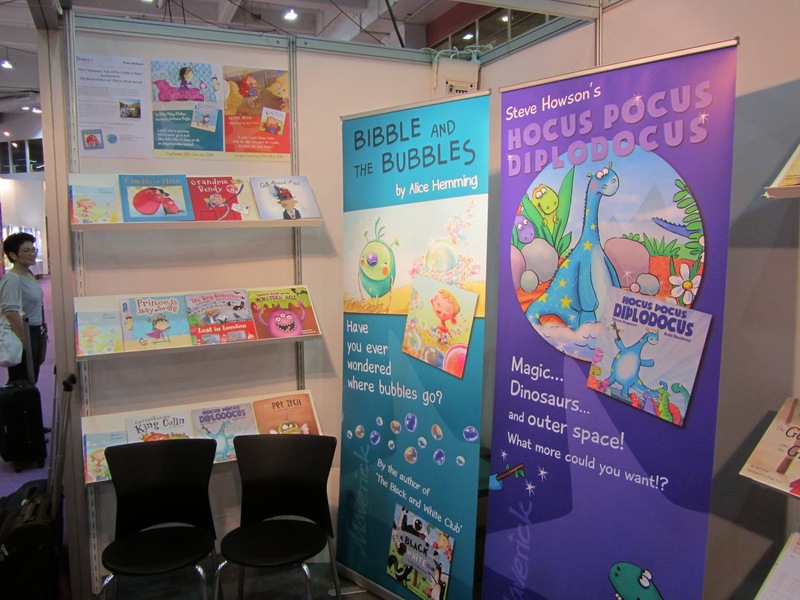 As a new title, Hocus Pocus Diplodocus featured prominently on the stand, as you can see below – so hopefully it got noticed by all the right people. All in all, it’s been a magical couple of months. Next stop – publication day!